A 3-0 start to the season with the rookie quarterback performing minor miracles apparently blinded Eagles fans to the fact that the team really isn't that good. 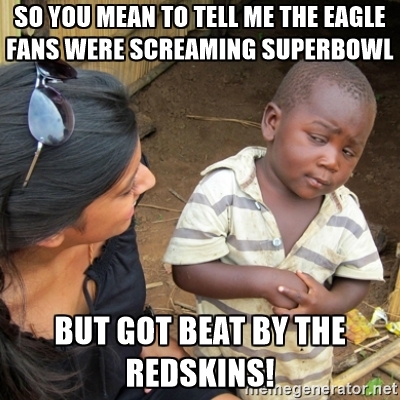 That fact became apparent when the Washington Redskins soundly beat the Eagles 27-20 on Sunday. The final score makes it seem like it was a close game, but it really wasn't. 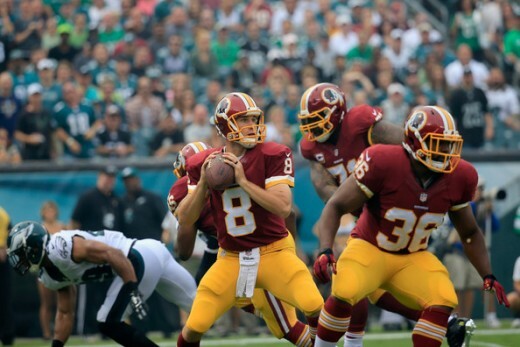 The Redskins out-gained the Eagles 493 to 239 in total yardage. That's amazing, since the Eagles were only giving up 266.8 yards per game before Sunday. The Redskins rushed for 231 yards against and Eagles defense that came into the game ranked 3rd in the NFL against the run, giving up only 73.2 yards per game. And the Eagles continued their disturbing, destructive trend of committing killer penalties. They were flagged 13 times for 114 yards, a week after committing 14 penalties for 111 yards. It was a lot uglier than the final score would indicate. 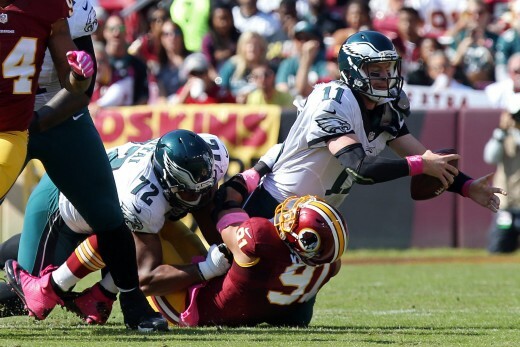 You knew the Eagles were in trouble from their very first offensive snap, as OLB Ryan Kerrigan sacked Eagles QB Carson Wentz. Although Kerrigan beat TE Brent Celek on that play, he also beat rookie RT Halapoulivaati Vaitai for 2 more sacks. Vaitai looked like a rookie who had never dressed for an NFL regular season game before and it should be a long, long time before he dresses for his second. I haven't seen blocking that bad since Osi Umenyiora abused rookie RT Winston Justice for 6 sacks in a 2007 game. If Eagles coach Doug Pederson doesn't move LG Allen Barbre to RT and insert veteran lineman Stefen Wisniewski at LG, he might lose part of his locker room and he will certainly lose part of the fanbase. Vaitai simply isn't ready to play in the NFL yet. The game actually started off as a punting exhibition in the 1st quarter, as the Redskins scored the only points on a 16-yard TD pass to Jamsion Crowder. That drive included a long completion to ex-Eagle DeSean Jackson and a few penalties that extended the drive. In the second quarter, the Redskins increased their lead with a 9-play, 90-yard drive that ended with a 13-yard TD catch for TE Vernon Davis, who was playing for the injured Jordan Reed. 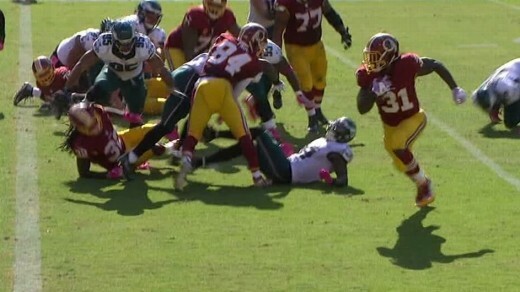 The Redskins gashed the Eagles on the ground during that drive, in what would be become a theme throughout the game. The only good thing for the Eagles was that Davis was flagged for excessive celebration, when he shot the football through the uprights like a basketball after scoring. 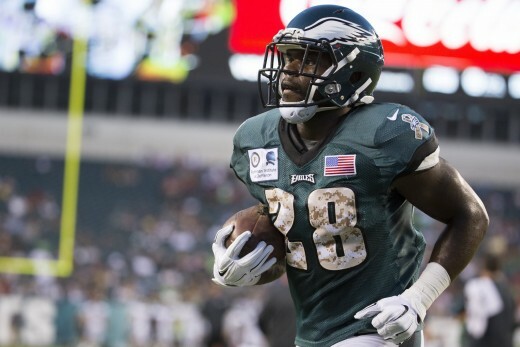 That 15-yard penalty moved the ensuing kickoff back and allowed Wendell Smallwood to field the ball at the 14 yard line and return it 86 yards for a TD, to cut the lead to 14-7. The Redskins continued to move the ball at will on the Eagles in the second quarter, but the Eagles did manage to make one defensive play. The weirdest thing is who helped cause the miscue by the Redskins. First round draft bust, DE Marcus Smith actually pressured Cousins into throwing a bad pass behind his intended receiver and safety Malcolm Jenkins jumped the route and returned the INT 64 yards for a TD to tie the game. Thus ends the portion of this article detailing positives for the Eagles. The Redskins got right back to beating the Eagles defense like a rented mule and drove straight down the field again as the first half was winding down. The Eagles actually forced a 3rd down incompletion in the redzone, but a roughing the passer penalty on Fletcher Cox gave the Redskins new life and a first down at the Eagles 2 yard line. They some converted that into another TD, as Matt Jones scored to give Washington a 21-14 lead at halftime. At halftime, the Eagles had showed nothing offensively or defensively, with the exception of Jenkins' INT return for a TD. They had 48 yards in the 1st quarter, negative 7 yards in the second quarter and Wentz had thrown for a whopping 12 yards. Washington out-gained the Eagles 285-41 in the first half. It was ugly. The ugliness continued in the second half, as the Redskins took the opening possession right down the field and added a Dustin Hopkins 32-yard FG to increase their lead to 24-14. At this point, the Redskins had run 38 consecutive plays, if you didn't count the kneel down the Eagles did on the last play of the first half. The penalty woes continued for the Eagles in the second half, as a flag on Smallwood negated a 48-yard completion to Dorial Green-Beckham and led to a punt. That would be their one and only offensive possession of the entire third quarter. Fortunately, the Eagles actually managed to get a couple of first downs on their next possession that ended with a 38-yard Caleb Sturigs FG to cut the lead to 24-17. For those of you keeping track, it took the Eagles until 12:56 was left in the game before the offense scored their first points. Did I already mention that things were ugly? The teams traded FGs to get to the final score of 27-20, but not before Zach Ertz dropped what would have been a sure TD. The Eagles also had one last chance to tie the game, but Wentz was sacked twice and the Eagles punted with 1:44 left in the game. Any chance of the Eagles getting the ball back for one last chance was dashed when they allowed Matt Jones to rumble 57 yards on third down and the Redskins took a knee to kill the clock and any thoughts that this Eagles team is a legitimate contender this season. As I said, the score was deceiving because of a kick return TD and Interception return TD. Wentz finally looked like a rookie, completing only 11-of-22 passes for 179 yards, without a TD or INT. And Ryan Mathews led the anemic rushing attack with 9 carries for 60 yards. I'm not sure what was worse, the fact that the Eagles couldn't stop the rushing attack of the Redskins that was ranked 25th going into the game or that the Eagles couldn't run the ball against a Washington run defense that was ranked 30th coming into the game. Call it a draw. I guess credit for the win really goes to the Washington offensive line that absolutely dominated the Eagles front seven. They couldn't slow down the Redskins running game and didn't even get close to Cousins, let alone get a single sack. Maybe we were all right to be leery of the return of the Wide-9, after all. It has not looked effective the last two weeks against teams that aren't even good at running the ball. The confusing thing is that as bad as the Eagles defense has looked the last two weeks, they still haven't given up a TD in the second half this season. Strange. The loss drops the Eagles to 3-2, behind the 5-1 Cowboys and 4-2 Redskins in the NFC East and the schedule is about to get brutal. The Eagles host the Vikings, travel to the Giants and Cowboys, host the Falcons, travel to Seattle and host the Packers. The combined record of those teams is 22-7. Anybody even see 3 wins among those games? This game should serve as a sobering wake-up call to Eagles fans. Yes, Wentz has looked great so far in his brief NFL career, but he is still a rookie. He looked like one against the Redskins and there will be more games like this one the remainder of this season. The defense played great the first three weeks, but got exposed the last two. The special teams are still among the best in the NFL, but the team is committing way too many penalties. Before the season, even the most optimistic Eagles fans thought an 8-8 season would be good for the team. Now that .500 record seems just about right after they got scalped by the Redskins.